Why are there so many broken customer experiences on the phone? 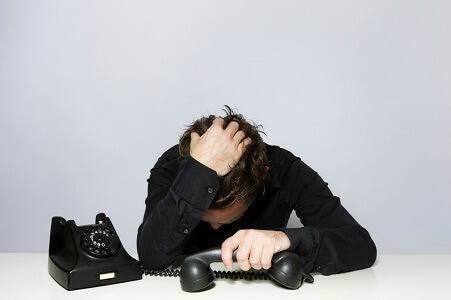 Call center services from traditional vendors are still making people wait on hold. Why do businesses have to risk losing sales and annoying customers by making them wait? When we got to thinking about the problem more, we realized that to crack it, we need to go to the core of the issue: What barriers prevent businesses from creating great phone experiences? Why is it so expensive to solve common big problems: For example, why is it so difficult to do contract closures and compliant payments on the phone? We set out to tackle these problems from the ground up: from telecoms infrastructure to the business process solutions. Even more it is our aim to enable integration of call processes with your core systems: CRM, agent desktops and marketing automation? What if all this could cost less – like way less than with a traditional telephony service? A solution like that would mean a sea change in your customer service. This is what babelforce is all about. Because any customer experience touches a lot of processes, it was clear to us from early on that achieving our goal requires a very open way of doing business. It has to be based on free and fair exchange and building win-win relationships – with clients, their suppliers and partners and our partners. That’s why we have defined principles that we follow in everything that we do. We aim to be the easiest company you’ll ever deal with. babelforce just works. We are a team combining contact center & telecoms veterans with rockstar developers & extreme sport experience designers. We are the base jumpers of cloud communications. Our vision is to provide companies with a carrier-grade platform and the tools to solve significant call and communications challenges. And we are convinced that a business does not have to trade off quality against cost. We want companies to have 10 times better call center services. That’s why we’ve built our cloud based services and apps platform on top of a multi-carrier telecoms network – we have more than 40 carriers integrated. We want to be able to guarantee high quality service – you should be able to rely on your teams having the highest quality communications possible! We need to get it right for people – everything else follows from that. We have to set our expectations high here: we view it as a disgrace when a person has to wait on the phone instead of getting a reliable promise of an appointment. Our job is to make it easy for companies to do that elegantly. It’s fast or it’s nothing. This means it has to be fast for all people: from consumers to your IT team and unified communications. If babelforce is hard to integrate or adapt, then we haven’t done our job. If billing is complicated, that’s not good enough for your finance folks. You have enough to do without us getting in the way – so we won’t. Too many business solutions try to grow accounts by locking in the customer. We won’t do it! In fact, we want to make sure that you can leave easily, i.e. so that we know you stay with us because we are doing right by you. There is no point in stacking up features unless each problem is solved in the most elegant and efficient way possible. That is why we focus on solving each business problem completely. Each part of the product has to give you the benefit you are expecting. The flip side of focussing is that we have to always respect the other solutions and suppliers you have in place. Even more than that: our job is to make sure that our solutions work with your existing technology and processes. We are very easy to partner and integrate with! Everything is about relationships. We work in partnership with all our customers. You only know each other once, so make it worthwhile. “Goods are good, but betters are better”: We aim to have a positive impact wherever we can. We give our product and expertise to community interest organisations, NGOs, charities, … We also love to work with our customers and partners on social projects. Contact us if you have a social impact project where you think we can offer something.